Hal Brickman, LCSW-R, C. Ht., the Director and founder of Professional Couples Counseling of Long Island, is an experienced and highly respected psychotherapist. He received his M.S.W., from Fordham University Graduate School of Social Services in 1975. In 1979, Hal was awarded a Certificate in Psychoanalytic Psychotherapy from the prestigious Long Island Institute of Mental Health’s 3 year post-graduate training program. Hal Brickman has supervised staff psychotherapists for over ten years. Hal’s literary contribution to the field of Psychotherapy has been embraced by Psychotherapists worldwide and has been translated into six foreign languages. He has been invited to appear as a featured guest on David Letterman’s Late Nite on two separate occasions. Hal was also invited to appear as a guest on a television health show pilot hosted by Dr. Rock Positano of The Hospital of Special Surgery. 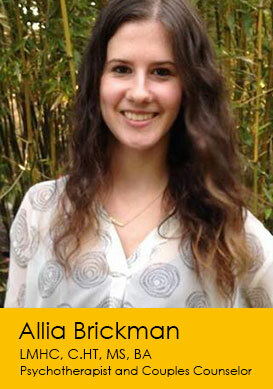 Allia Brickman, LMHC, C.HT. is a highly accomplished individual and couples counselor with extensive experience working with those dealing with a wide-range of issues such as anxiety, depression, relationships, self-esteem, sexuality, or simply looking for someone to talk to. Her focus is working with you in pinpointing and stepping over the road blocks between you and what you want out of life. Allia has done expansive research in the field of psychology, studying stress and the most effective coping techniques, the nature of romantic and familial relationships, trauma recovery, and more. She uses this cutting edge research along with a warm, empathic approach in her dedicated work with clients. We welcome e-mail and phone inquiries.